Smartwatches and fitness trackers have not held a great track record for high accuracy sensors but that could soon change. 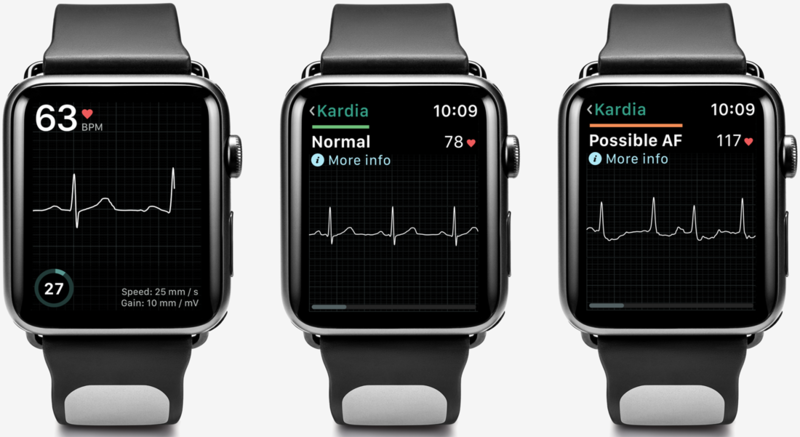 KardiaBand by AliveCor is a new watch band for the Apple Watch that has received FDA approval for EKG capture. Utilizing an embedded sensor in the watch band, accurate heart rate signals can be capture in as little as 30 seconds. Installing the Kardia app on an Apple Watch enables a feature called SmartRhythm that uses AI and sensor fusion to look for differences in activity level and heart patterns. A notification is pushed to a user and an EKG is captured if there are unexpected results. The primary benefit of an accurate heart monitoring tool is early detection of cardiovascular abnormalities. Atrial fibrillation is one of the leading causes of stroke. It rarely shows any noticeable symptoms but can be diagnosed with proper medical equipment. Nearly two-thirds of strokes could be prevented through early diagnosis of atrial fibrillation with the help of portable, always-on EKG devices. KardiaBand is now available for purchase at a retail price of $199. An annual subscription for $99 is required for regular use. Unlimited EKG readings are stored in the cloud and can be easily e-mailed to anyone for further analysis. Additional health data can also be stored and tracked such as weight and medications being taken. Monthly reports on recorded data are mailed to end-users. Home health care and the next generation of wearables are slowly evolving for the better. Future smartwatch and fitness tracker developers may begin to seek FDA approval instead of relying on accessories but expect additional costs associated with FDA-cleared gadgets.